Food Explainer: Why Does Tomato Sauce Splatter When It Cooks? Tomato sauce splatters because it has high viscosity. Actually, it has everything to do with consistency. The more viscous a liquid is, the more it will sputter and splatter when cooking. Water has a very low viscosity. In other words, when force is applied to it, its molecules easily slide around one another and it flows. When water is heated, then, its particles move around easily, and steam escapes with little resistance. As a result, water barely spits at all when it comes to a boil. Tomato sauce, which is considerably thicker than water, puts up more of a fight. Like ketchup, tomato sauce is a highly viscous substance, which is to say that it resists movement because there’s considerable amount of friction between its molecules. It’s also technically known as a plastic liquid. This means that a substantial amount of effort or force is required to make it flow, but once it starts moving, it does so quite easily. So when the liquid in tomato sauce reaches its boiling point, steam pressure builds up beneath the surface of the sauce. For a while, the sauce remains unmoved, but finally the pressure comes to a head and the sauce gives way, erupting to release the steam. The result is a big, fat, messy explosion with enough momentum to send droplets of tomato sauce right out of the pan. The more intense the heat, the faster the sauce boils, and the more steam is generated. Keeping the heat on its lowest setting will minimize the frequency of outbursts, as it will take more time for the required amount of force to build up to initiate an eruption. But it won’t do away with spluttering altogether, especially if you’re heating sauce that’s already thick to begin with. So why is tomato sauce so viscous in the first place? When tomatoes are crushed, they become a loose mix of insoluble cell walls and fibers suspended in a watery solution. Bring this mixture to a simmer, and the suspended insoluble tomato particles start to crowd together as the water evaporates. These particles become entangled with one another, creating a dense web that’s increasingly difficult to penetrate. The end result is that the contents of the pan become more viscous. Tomatoes also contain pectin, a complex carbohydrate that functions like glue holding cells together. Crushing the tomatoes releases the pectin, and as the sauce reduces over the heat, the pectin content becomes more concentrated and has a thickening effect. More and more force is then needed to move the sauce and create pathways for steam to pass through, which in turn leads to ever more potent eruptions. 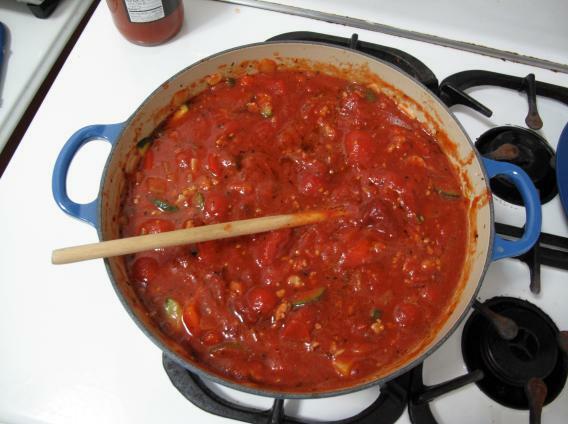 With all this spitting and splattering, long sleeves (or long oven mitts) are a must when you’re making tomato sauce, and it’s not just to avoid having to wash your forearms afterwards. Another characteristic of plastic liquids is that while they flow easily once enough force has been exerted, they will come to a standstill very quickly afterward. (Consider a dab of tomato ketchup sitting pert on a French fry, or tomato sauce coating a strand of spaghetti.) In this way, plastic liquids are quite different from water, which doesn’t stop flowing once it starts. This important distinction is what makes a splotch of hot tomato sauce produce a worse burn than a splash of boiling water. Water will run off your arm immediately, but a splash of tomato sauce will linger on your skin in a focused area, making it all the more likely that you’ll suffer from an ugly blister. Food Explainer thanks Malcolm Bourne of the New York State Agricultural Experiment Station at Cornell University.